Western diplomats and Bosnian legal experts urged prosecutors to investigate the alleged incitement of religious and ethnic hatred at a rally by uniform-clad Serb nationalist Chetnik supporters in the town of Visegrad. 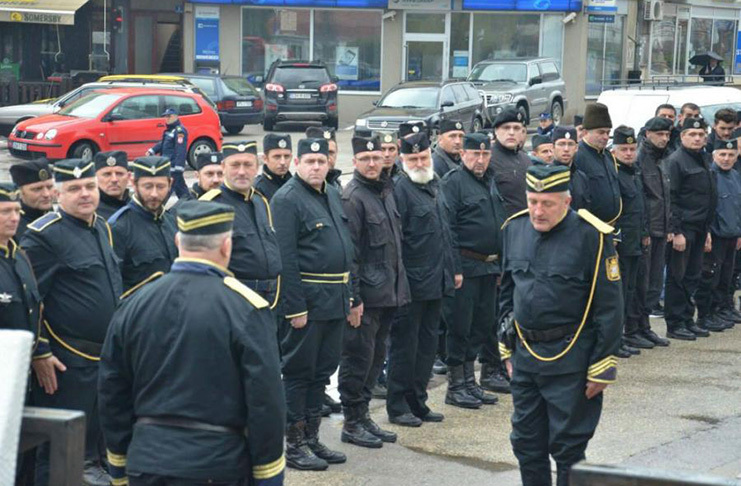 Prosecutors have been urged to launch a probe after members of the Ravna Gora Movement – widely known as the Chetniks – held a gathering in the eastern Bosnian town of Visegrad, wearing black uniforms and reportedly singing ethnically provocative songs. AFP news agency reported that the Serb Chetnik supporters were filmed on Sunday singing that “the River Drina will be bloody again”. Visegrad, which lies by the River Drina, was the scene of war crimes by Serbs against Bosniaks in 1992. Bosnian Security Minister Dragan Mektic said on Monday that his ministry will file a report on the Chetnik rally to the state prosecution. “The agreement is that we will document the whole event, especially from the point of reference of messages and everything that was heard yesterday in Visegrad, and in the next few days, it will be delivered to the Bosnian Prosecutor’s Office,” Mektic told a press conference. “But the fact is that the prosecution has to decide whether or not to launch an investigation in this case,” he added. The rally is held every year to commemorate the day when Dragoljub Mihailovic, the leader of the World War II Chetnik movement, was caught by the Yugoslav Communist authorities in 1946. During WWII, his forces committed war crimes and other atrocities, including crimes against Bosniaks in the Visegrad region. Lawyer and former judge Vasvija Vidovic told BIRN that prosecutors should investigate because a criminal act was committed at the rally. “What has been happening in Visegrad year after year, reaching its culmination this year, certainly constitutes a criminal act of inciting religious and ethnic hatred. At the very least, this was clearly hate speech,” Vidovic said. “It is not only about the gathering or peaceful gathering, but you saw the worst fascist messages aimed not only at causing ethnic hatred, but also animosity and fear among the local population, [post-war] returnees, and finally, local Orthodox Christians who do not share fascist ideas too,” she added. A criminal act of inciting religious and ethnic hatred exists in the criminal code of Bosnia’s Serb-dominated entity Republika Srpska, where Visegrad is located, and in the Bosnian state-level criminal code. The US embassy in Sarajevo condemned Sunday’s rally and urged the Bosnian authorities to act. “We are appalled by reports of threats and nationalistic rhetoric during today’s event in Visegrad. Such behaviour is unacceptable,” the embassy said in a message on Twitter on Sunday. “We expect the relevant authorities to take the necessary steps to address these threats and hold accountable those responsible,” it added. Denis Zvizdic, the head of Bosnia’s Council of Ministers, said on Sunday that the gathering brought back memories from the 1990s, when the “Chetnik ideology, racism and hegemonism were the basis of the brutal aggression [in Bosnia]”, N1 TV reported. But Dusan Sladojevic, one of the organisers, defended the Chetnik rally, saying it was to celebrate Dragoljub Mihailovic, who he described as “a man who dedicated his life to freeing the Serbian people, as well as the development of democracy and defending the homeland from fascist aggressors”, Al Jazeera reported.